Competition is hotting up between electricity supply teams from around New Zealand at Annual Connection 2018 in Christchurch. 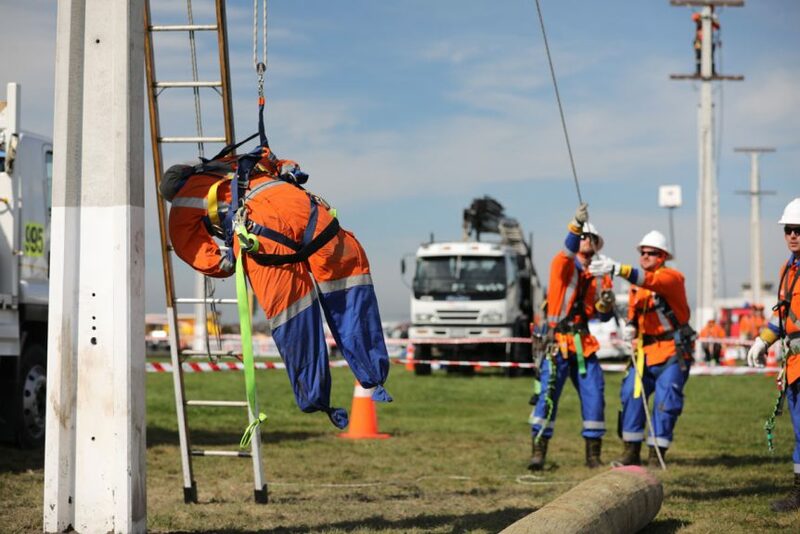 The annual competition sees linesmen and cable joiners competing in an intense series of events over three days outdoors in a field adjacent to the Air Force Museum in Wigram. This year nine teams are competing in the line mechanic competitions, with events including a pole top rescue, team building and first aid competitions. Ten individuals are competing in the cable jointer competitions. The event is open to the public and is also a driver to attract more people to the electricity supply industry, which is short of skilled workers nationwide. It’s predicted that about 9,000 more staff will be required over the next five years. Annual Connection is organised by Infrastructure Industry Training Organisation (ITO) Connexis. Group Manager Customer Engagement Kaarin Gaukrodger says, “The event is a valuable industry event and demonstrates the skills and expertise of these workers who keep New Zealand’s power supply up and running. “People take it for granted that their lights will work and that they have power to heat their home and cook meals but sometimes due to storms, snow, floods or even car accidents taking out power poles the power is temporarily cut off. Powernet Invercargill’s Sam Maurangi is in her second year competing at Annual Connection and loving it. She’s a recently qualified line mechanic and says she loves the diversity and challenge of her job. Annual Connection also features a large supplier expo, before culminating with the industry’s Excellence Awards on Thursday night where Canterbury sporting legend, Super 15 coach Scott Robertson, is the keynote speaker. At the awards finalists compete for honours in five categories: Distribution Trainee of the Year, Telecommunications Trainee of the Year, Investing in Youth Training and Development, Generation Trainee of the Year and Advanced Trainee of the Year 2018. Winners from the Distribution, Telecommunication, Generation and Advanced categories will also be eligible for the 2018 Overall Trainee of the Year. That person will be named the industry ambassador for the next 12 months. Helicopters and skilled pilots play a crucial role in keeping the country plugged into the electrical grid and Richie McCaw from Christchurch Helicopters, officially opened Annual Connection yesterday.